Green technologies are often earlier in the development stage and not always commercially viable, making them more expensive and riskier ventures. The incremental cost gap between conventional and green investments needs to be justified and filled, especially at the earlier stages in technology development. The private sector will continue to be an increasing source of green finance while the public sector has tended to fill the incremental green cost gap through policy-support mechanisms, such as feed-in tariffs and subsidies. In the longer term, sustaining such public-sector subsidies is questionable given the current economic climate. Optimal financing structures on a sectoral basis will ultimately depend on the context. For example, for energy investment, debt provision from banks will play a larger role, while for transport-sector investment, the public sector will need to provide loss-absorbing equity. As such, the public sector can reduce the cost of capital and provide incentives to invest through proven interventions. Reducing the cost of capital by providing loans (debt) is the most common source of finance for up-front and on-going project costs. Low-cost debt (concessional finance) from DFIs can provide debt at lower interest rates over a longer term compared with commercial bank loans and will play a significant role in distributing long-term green finance, particularly in developing countries.u Examples include the European Bank for Reconstruction and Development (Box 5) and the European Investment Bank. The European Investment Bank has dramatically increased its lending for wind and solar energy in particular in recent years and delivered 5.5 billion euros (about US$ 7.25 billion) in 2011. Energy efficiency is also a critical sector, attracting 1.3 billion euros (US$ 1.7 billion) of EIB’s lending in 2011. DFIs are also prominent in dispersing money from the Climate Investment Funds, which have been shown to mobilize significant amounts of co-financing from other sources (see Box 3 below), highlighting potential for scale-up. The public sector has also provided loans through financial intermediaries such as commercial banks. This approach can increase the awareness and willingness to lend in newer or less-established markets. In Thailand, the government established a revolving fund (see Appendix 2) in 2002 to provide loans, grants and subsidies to promote energy efficiency. Commercial banks were able to use this funding for energy-efficiency project loans. This not only encouraged the banks to lend in an emerging market but additional finance was also mobilized towards the projects. Through the revolving fund, financial-sector capacity has increased in the energy sector, and loans that have been used to fund capital projects have resulted in reducing peak load energy by more than 500 megawatts. Green bonds (Box 4 below) are another emerging source of finance, with an estimated market size of US$ 174 billion,70 which can also help reduce capital costs of green investment and close the cost gap. In September 2008, 10 leading industrialized nations pledged more than US$ 6.1 billion to finance two Climate Investment Trust Funds (CIFs): the Clean Technology Fund (CTF) and Strategic Climate Fund (SCF). The funds were designed to provide financing for climate-related investment to combat climate change. They are disbursed as grants, highly concessional loans and risk-mitigation instruments,71 and are administered through multilateral development banks (MDBs) such as the World Bank Group. 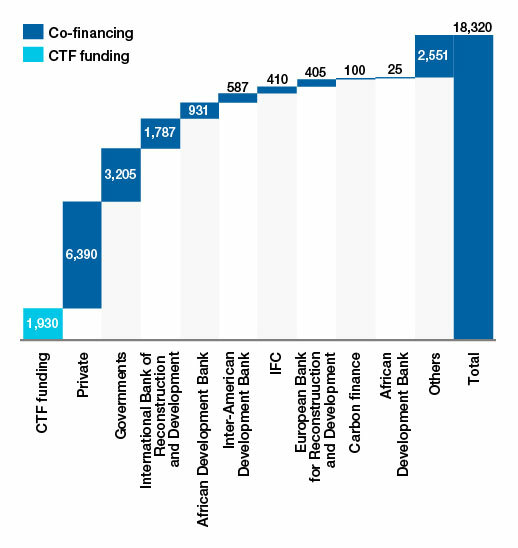 As of September 2012, US$ 2.2 billion had been pledged from 13 donors for the SCF. To date, 95 projects have been approved across the three programmes, totalling US$ 383 million in grants and near-zero interest credits. Funding from the SCF is expected to leverage an additional ~US$ 1 billion in co-financing from other sources, implying a leverage ratio of 1:2.6. Green bonds are widely believed to have significant potential as a means to access deep pools of relatively low-cost capital that is held by institutional investors for green and climate change-related projects. These investors typically avoid direct investment in green infrastructure and have historically preferred to invest via private equity-style infrastructure funds or through the listed debt or equity of infrastructure companies and developers. There are, however, an increasing number of exceptionsw to this rule where pension funds have invested directly and brought the skills to do so in-house. Alongside this trend, institutional investors are often seen as natural buyers of green bonds, given their appetite for investment in low-risk, fixed-income products with long-term maturities that match their long-term liabilities. Institutional investors, however, often lack the means to gain exposure to the green infrastructure market, but with a credit-rated and potentially liquid green bond market, institutional investors could potentially channel far more funds into the sector. Project bonds are a specific and relatively small subset of the larger green bond market. Project bonds provide a means for infrastructure project developers to attract long-term debt financing from the international or domestic bond markets. This can be done by creating a special purpose vehicle, supported by a degree of equity from a sponsor (often pooled from project developers). Based on an assessment of the financial viability of the underlying projects, a credit rating can be secured for the vehicle, and if it is sufficiently high, bonds issued. Bond finance raised through these means can be cheaper than commercial loans and non-recourse project-finance options. This can be a significant advantage for clean-energy projects where financing can represent a significant proportion of overall costs. Project bonds also provide an important opportunity to recycle limited quantities of construction capital through refinancing projects. Public action to either take an equity stake in projects or create attractive investment conditions for potential equity providers can help raise additional capital through other financing mechanisms by absorbing potential losses to other financiers. Direct equity investment from the public sector can be valuable for projects with heightened technology risks (those, for example, at an earlier stage of development or at the pre-commercial stage). This will be critical in markets with higher risk where the appetite for lending is limited. Pension funds have also been mobilized as a source of private finance through careful risk allocation (as seen in the case of Walney Offshore Windfarms in the UK). With US$ 71 trillion of assets under management in the OECD in 2011,77 institutional investors are a potentially important source of finance for green growth. Successfully mobilizing institutional funds in equity injections can be achieved through complex financial engineering by providing the investor with a ‘quasi fixed-income position’, for example, by sharing the benefit of public financing incentives (such as feed-in tariffs) in renewable-energy projects. A fixed-income position can provide the investor with long-term returns in line with their investment strategy and risks. Opportunities exist to develop green projects with long-term returns that can attract institutional investors but the public sector needs to support this through improved policy frameworks. u For a discussion on the role of multilateral agencies and financial institutions, see: Venugopal, S. et al. “Public Financing Instruments to Leverage Private Capital for Climate-Relevant Investment: Focus on Multilateral Agencies.” November 2012. WRI Working Paper, World Resources Institute, Washington, DC. 69 Public Financing Instruments to Leverage Private Capital for Climate-Relevant Investment: Focus on Multilateral Agencies.” November 2012. WRI Working Paper, World Resources Institute; http://www.wri.org/project/climate-finance-private-sector. 70 2012 Bonds and Climate Change, The State of the Market, 2012, Climate Bond Initiative and HSBC; http://climatebonds.net/wp-content/uploads/2012/05/CB-HSBC_Final_30May12-Single.pdf. 71 Donor Nations Pledge Over $6.1 Billion to Climate Investment Funds, News Release, 26th September 2008; http://go.worldbank.org/36H73DPMV0. 72 Data available at: https://www.climateinvestmentfunds.org/cif/node/2. 75 2012 Bonds and Climate Change, The State of the Market, 2012, Climate Bond Initiative and HSBC; http://climatebonds.net/wp-content/uploads/2012/05/CB-HSBC_Final_30May12-Single.pdf. 76 OECD (2012), Financing Climate Change Action brochure, http://www.oecd.org/env/climatechange/Financing%20Climate%20Change%20brochure.pdf. $86bn is a composite figure comprised of the $16bn officially provided as the OECD estimate of ‘green bonds’ and including the $70bn estimated to have been raised by ‘green’ corporate bonds excluded from their definition. w ATP, the Danish pension fund, has its own clean-energy fund, and some pension funds are establishing in-house infrastructure investment capabilities. For example AimCo, the Alberta Investment Management Corporation, and Calpers, have both invested directly in infrastructure projects in the past year. 77 Kaminker, C, Stewart, F (2012), “The Role of Institutional Investors in Financing Clean Energy”, OECD Working Papers on Finance, Insurance and Private Pensions, No. 23, OECD Publishing, Paris.